Departing from the market town of Romainmôtier, there are seven suggested walks for hikers taking between one to more than three hours. These include easy trails and more challenging routes for walking enthusiasts. These seven walks invite hikers to discover the surroundings of Romainmôtier and the Valley of Nozon. Certain hikes such as the ‘Fountain circuit’ or the ‘Heritage path’ are marked for hiking tourism while others follow the river Nozon to the villages of Croy, Envy or Pompaples. On the return leg, hikers can take a welcome break at one of the tea rooms in Romainmôtier, or perhaps one of two Gault & Millau restaurants in the area: ‘Le Gaulois’ in Croy and ‘L’Écusson Vaudois’ in Bretonnières. A map with the description of the seven walks is available at Yverdon-les-Bains Region tourist offices. Romainmôtier is a must-see village, both in terms of its prestigious monuments and its beautifully preserved natural environment that is highly appreciated by hikers. 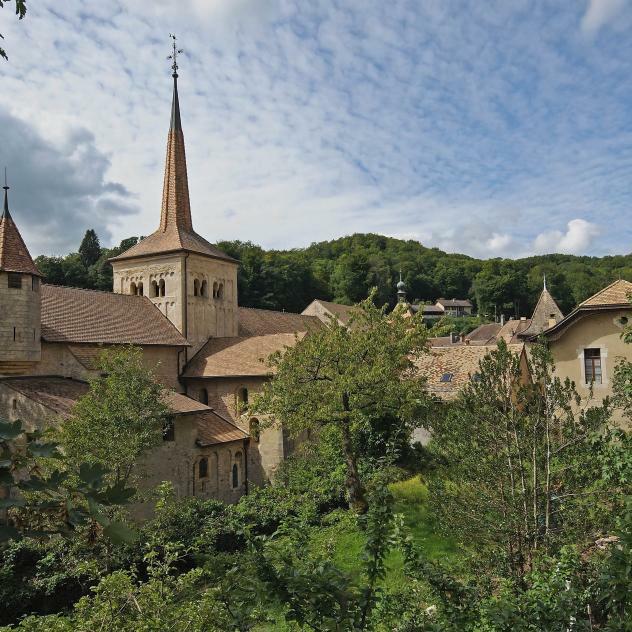 Nestling in the Jura mountainside and crossed by the river Nozon, the small medieval village is best explored on foot. Its picturesque streets offer superb views of the ochre- and yellow-coloured roofs below. The contrast is even more striking from the top of the Forel Belvedere or from the road from Juriens.